A disclaimer from the very beginning… I may have to cut this blog off unexpectedly, in a place where it makes no sense to conclude, thanks to Emma who is intent on being all up in Charlie’s business this morning. Charlie, while normally good natured about little hands running all over his face, is NOT going to take it today and keeps desperately trying to move that annoying sheep along by nudging her with his nose and snapping at the air around her. Emma is DELIGHTED by this, which is not what Charlie was going for, so I’ve got to keep re-directing Emma’s energies and attentions. And now that I’ve explained why I probably won’t finish this blog in any logical way, I have to tell you that I’ve decided something. I was sitting around yesterday, thinking on some of the things that have been happening lately, and in no time at all, I was so angry that I’m sure my blood was actually beginning to boil. Is it right what’s being done? No. Are the things that people are doing an offense to God? Most definitely. Does it help anything at all for me to get in a fury over it? No. Spiritual warfare is nothing new to God, and I’m finding that while the battle in this situation is most definitely real and raging, the skirmish produced in my own heart as a result leads me to sin. I can’t control how other people are allowing themselves to be used, but I can certainly trust that God has His own back covered (as if He needed my help) and that I need to just leave people to Him. I’m done with it. Just completely done with it. Now, remind me of that tomorrow. Because I will likely need reminding! We had a fun surprise waiting for us yesterday in the mail. I’m constantly entering sweepstakes and contests to win free trips to Disney Parks. Because free trips are a good thing, right? I’ve never heard back from any of these contests… until yesterday. In the mailbox was a bulky package addressed to me from a company called Plackers, and when I opened it, I was face to face with more dental flossers than I’ve ever seen in my life. I began wondering why my mother-in-law had sent this to me (because she’s the only person in our lives who buys online and ships straight to our house) when I found the letter. Apparently, I won the Plackers Sunny Smiles Sweepstakes… the SECOND part of the sweepstakes, that is, which was 520 dental flossers! Not nearly as exciting as winning a trip to Florida or California, but you just can’t be disappointed about free dental floss. As I told my mother, this is proof that someone out there is actually winning each and every one of these crazy giveaways, and I might as well keep on entering. “Who knows?,” she said. “Next time you might win yourself some soap or toilet paper!” I would prefer the Disney trip, of course, but I would take either one of those prizes. Just so you know. Emma has rediscovered her old friend, Fergus the Frog. 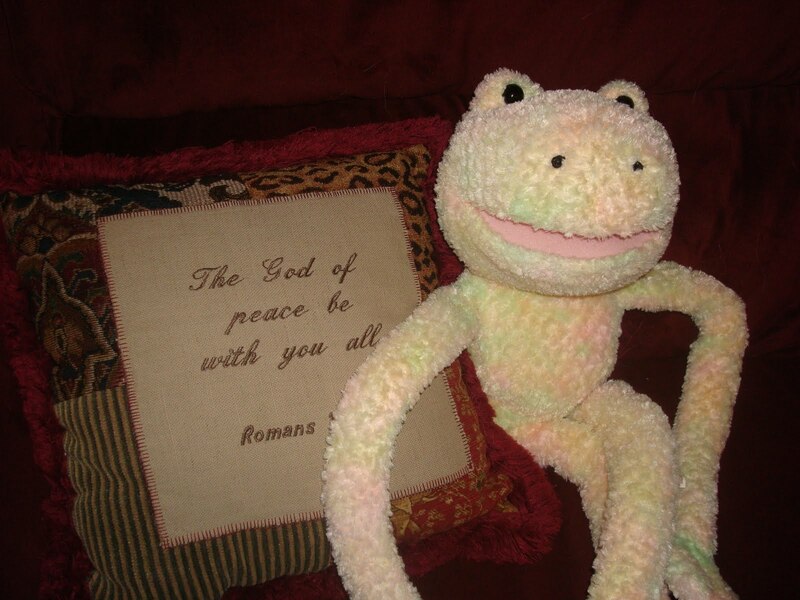 Fergus is a frog puppet that we bought in Japan for Ana’s first Christmas, and thus far in his short lifetime, he’s been a guest speaker at multiple VBS events. I get to teach the youngest kids, and they prefer Fergus to me, so I’ve let him teach the class. He’s been in Emmy’s room since the summer, but it’s only been recently that she’ll bring him to me and tell me, “Fergus needs to talk.” Ana has gotten in on the fun, and I have to confess to you that after only a week or two of around-the-clock Fergus action that I’m kind of hoping that the hysteria dies down. There are only so many funny tricks and jokes a frog puppet can perform, and while the girls aren’t tired of his antics (they laugh like little hyenas no matter what he does), I feel like I’m going to get arthritis in my hands well before my time. And I’m just a little insulted that playing with me (as Mommy) has been totally and completely usurped by playing with Fergus. But who can blame them, right? He is a fabulous conversationalist, after all. Ana came home from school a few weeks ago with just a little bit of information about a “100 day project” that she needed to complete. The details were fuzzy, but I thought I understood it well enough. To celebrate her one hundredth day of school (next Monday), she needed to bring in a unique display of one hundred similar items. We thought about it, then went shopping to buy one hundred colored beads and all that we would need to make them into a necklace for Ana to wear. She was so excited about the project and worked so hard to string all of those beads by herself, making what is actually a pretty good looking necklace. Done! Check! Except not because yesterday, Ana brought home more complete information about what the project should be. She has to bring a HAT with one hundred items displayed on it. The lesson learned here is to wait until the last minute to get things done because the information might change right before the due date. Ha! Oh, well. Ana had a great time making that necklace (and Emma had a great time making one from the leftover beads as well), and I’m sure I’ll have a great time helping her hot glue one hundred sequins to a hat. Right?